Finding decent and affordable hotel accommodation in Rio de Janeiro can be quite a challenge. A brief look at Tripadvisor’s hotel list reveals the highly inflated prices. I guess this is because of high demand and limited availability. The city also lacks the presence of several international hotel chains with those present only having a limited number of properties. IHG abandoned it’s only hotel property last October after a hostage drama and shootout on Aug 21, 2010 at it’s InterContinental luxury hotel. Since I couldn’t burn any points at my favorite hotel chains, cash was the only option for my Rio trip early December. My first three nights were booked at Novotel Rio de Janeiro Santos Dumont with a daily rate of EUR105 including breakfast. The room was small but looked new as the hotel opened only a year ago. Free WiFi and acceptable breakfast. Location close to the domestic Santos Dumont Airport (SDU) and Lapa, but not near the beach. I had hoped to cash in on my freshly achieved A-Club Platinum status (via HSBC referral link) but it resulted in zero perks at this Accor property. Not an unusual event for the A-Club loyalty program. For my last night, I decided to splurge and book at one of the few luxury hotels in Rio, the Porto Bay Rio Internacional. As they had no availability via their own site, I booked via OctopusTravel.com and paid EUR192,50 for a Superior Room with breakfast. 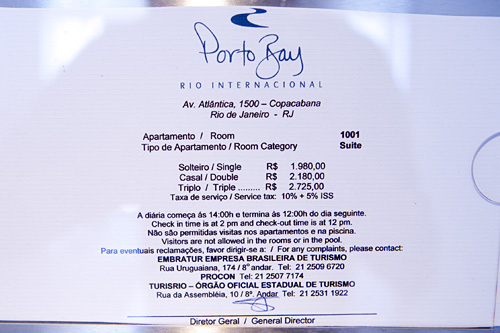 Upon arrival I was upgraded to a Suite, the highest room category with a rack rate of BRL2507 (EUR1030!) I guess adding @PortoBay on twitter had something to do with it. 🙂 The staff spoke perfect English, was friendly and the rooftop pool offered breathtaking views on Copacabana Beach. I think my pictures and video speak for themselves, Porto Bay Rio Internacional is a highly recommended property for your next visit to Rio de Janeiro! Planning a trip to Rio myself for May and still looking for hotels and hostels, Porto Bay seems to be great to end the vacation! Thx for the tip.